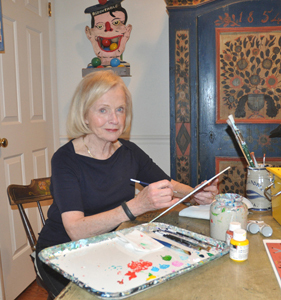 My name is Patricia Palermino and I’m an American Folk Art Artist. I’m a self taught folk artist who has been painting since I can remember. I’ve been publishing my unique collection of folk art paintings as prints and note cards for 20 years and have been showing my paintings in many galleries around the world. I live in Alexandria, Virginia with my family, where I create my paintings in my home studio because this is where I feel most inspired to paint. Many of my paintings have depicted the quaint villages, festivals, fairs and parades so common in the Alexandria area and nearby Washington, D.C. My paintings are primitive folk art prints and historical folk art prints that portray a true experience of those places. Painting has been my passion since I was a little girl and will always be a part of my life. My artwork can be seen and purchased on my online gallery, my Alexandria gallery and numerous other galleries across the US. My paintings are seen in very historical places including the White House, the National Archives, Winterthur Museum, the American Museum in Bath, England, the National Horticultural Society and others. My artwork has appeared on many posters and publications including the program cover of the National Easter Egg Roll at the White House, the UNICEF Corporate Christmas Card Collection, Historic Alexandria, Gadsby's Tavern Museum, Gunston Hall Museum, Woodlawn Plantation Museum, Winterthur Museum's Point to Point Races, United Card of Japan and others. Original paintings are sold at the Frank J. Miele Gallery in New York City.